What Is DA Form 7574? 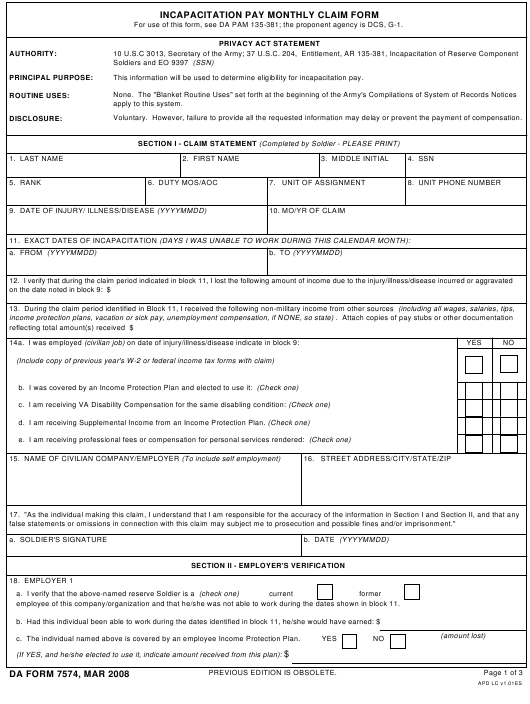 DA Form 7574, Incapacitation Pay Monthly Claim Form is a document used for claiming incapacitation pay and providing the information necessary to determine the service member's eligibility to receive it. The incapacitation pay monthly claim form has no security classification and is approved for public release with unlimited distribution. The latest version of the form - sometimes incorrectly referred to as the DD Form 7574 - was released by the Department of the Army (DA) in March 2008. An up-to-date DA Form 7574 fillable version is available for digital filing and download below or can be found through the APD website. Upon being notified of a soldier's injury or disease, unit commanders must immediately ensure that appropriate medical care is provided to the soldier depending upon the type of affliction or illness. The soldier must then be assisted in preparing the necessary claim form and be given travel orders to go to a Military Treatment Facility. How To Fill Out Da Form 7574? This information will be used to determine eligibility for incapacitation pay. Voluntary. However, failure to provide all the requested information may delay or prevent the payment of compensation. false statements or omissions in connection with this claim may subject me to prosecution and possible fines and/or imprisonment." employee of this company/organization and that he/she was not able to work during the dates shown in block 11.
c. The individual named above is covered by an employee Income Protection Plan. State laws which may subject the parties to a substantial fine and/or lengthy imprisonment. employee of this company/organization and that he/she was not able to work during the dates listed in block 11 of this form. c. Is the individual named above covered by an employee Income Protection Plan? offense under Federal and State laws which may subject the parties to a substantial fine and/or lengthy improvement. paid for duty after being determined unfit to perform military duty. 6. Duty MOS/AOC - 91B, 13B, 42D/66H, 70B. 9. Date of Injury/Illness/Disease (YYYYMMDD). 10. Month/Year of Claim (MM/YY or Claim) - 11/98, 12/98 or 03/00. e. f., g., h., i. Self-explanatory. a., b., c., d., e., f., g., h., i. Same as 18.a THRU e above. 22. Unit Identification code (UIC). during the incapacitation period reflected in Block II. 23. Same as block 6. Protection Plan. If you are, that amount will be deducted. 29. Point of contact within STARC/USARC/RRC/MSC. The soldier is strongly encouraged to file an incapacitation pay claim in case of a service-related injury, disease, or illness that prevents from performing military duties or has resulted in a loss in non-military income. In order to receive incapacitation pay, a correctly filled-in DA 7574 should be completed and submitted for each calendar month claimed. Section I - Claim Statement - must contain accurate personal data required for the identification purposes: the name of the soldier, their rank, SSN, unit of assignment, etc. The soldier is obliged to disclose nonmilitary earned income. It includes income from self-employment along with regular wages, nonmilitary employment, tips, professional fees, salaries, or any other compensations for personal services. It is necessary to indicate whether the service member had been receiving VA Disability Compensation or Supplemental Income from an Income Protection Plan at the time of sustaining the injury or illness and provide the exact days of incapacitation. The soldier must sign the section to certify that all statements are true. Providing false or incomplete information and the nondisclosure of outside income may result in a fine or imprisonment. Section II - Employer's Verification - should be filled in by the soldier's employer. It verifies the information on the applicants' employment, benefits and the amount of income lost. Section III - Commander's Verification - is filled in by the soldier's commander and verifies all of the information provided in Section I. Section IV - Review/Approval - is completed by higher headquarters or an approving authority. The completed DA 7574 and all paperwork related to the claim should be submitted through the chain of command. DA Form 7574-1, Military Physician's Statement of Soldier's Incapacitation/Fitness For Duty, is a form used by the physician to confirm soldier's eligibility for performing military duties. DA Form 7574-2, Soldier's Acknowledgement of Incapacitation Pay Counselling, is filed by the soldier to document that they have received the proper counseling regarding incapacitation pay.